Once again we get back to Langhe in Piemonte countryside. This is one of our favorite destination for a country wedding. 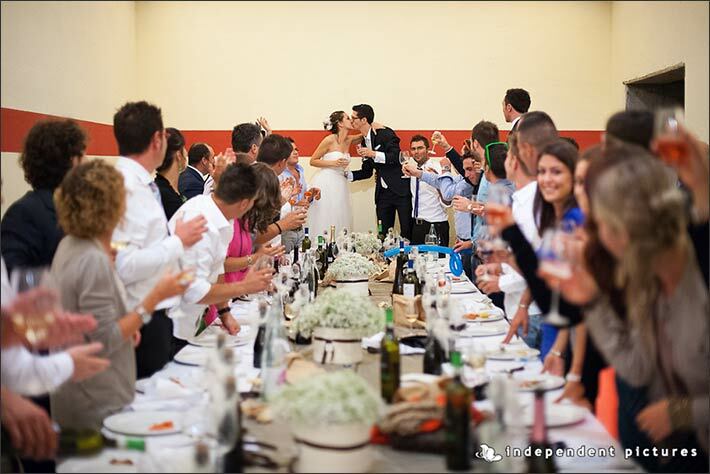 Here you can plan a simple, yet elegant and wonderful wedding in the country overlooking the vines enjoying great food and some of the most famous Italian wines! 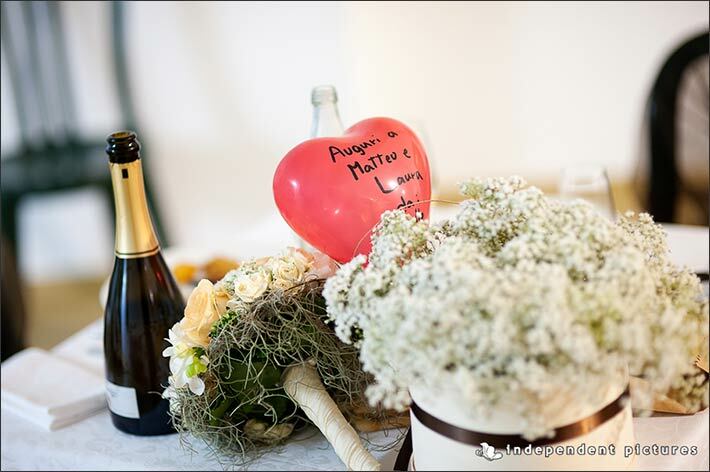 This is what Laura and Matteo did! They choose September for their wedding day. 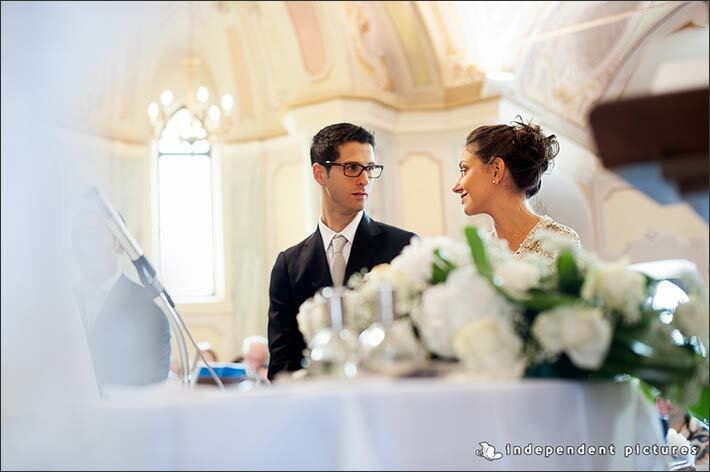 September could be one of the best choices for a wedding in Italy. The weather is mild and not too hot, days are beautiful and colours are warm and just amazing! 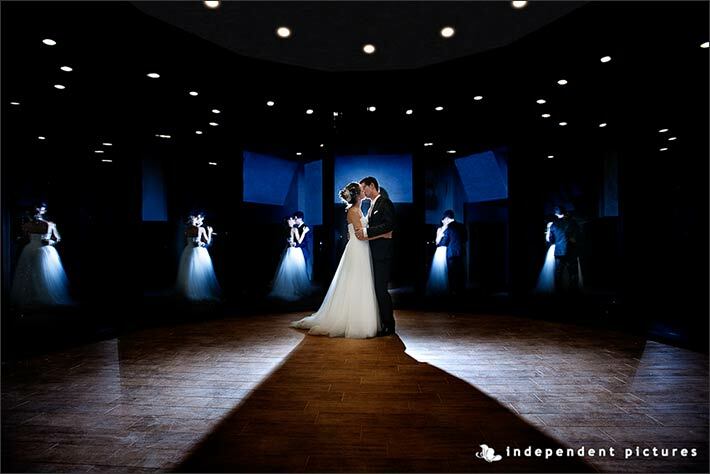 The ideal setting for wonderful pictures! 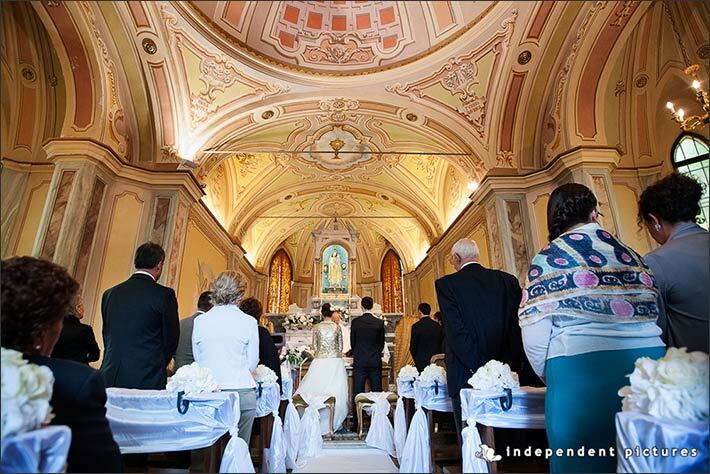 For their ceremony, Laura and Matteo chose a lovely little church over the hills of Canale a small town close to Alba. The church is small and intimate with lovely pastel frescos on the walls and ceilings. Outside it is all made of brown bricks as per Piemonte countryside tradition with a stunning view all over it! 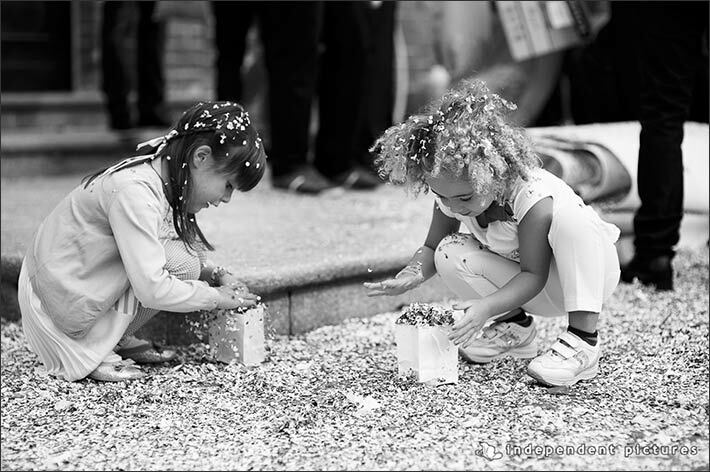 Have a look to the rice throwing at newly weds after the ceremony….this is a must for Italian weddings. 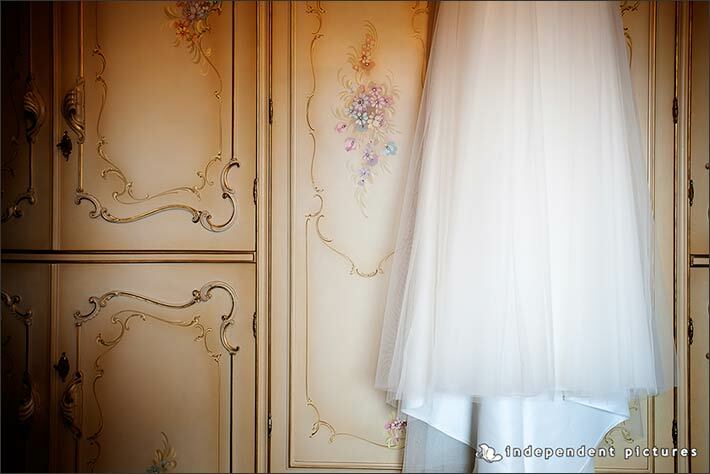 You could not miss it if you plan a traditional wedding in Italy countryside! Church was finely decorated in white with some touches of pastel colours in the shades of white and peach, just like Laura’s bouquet! 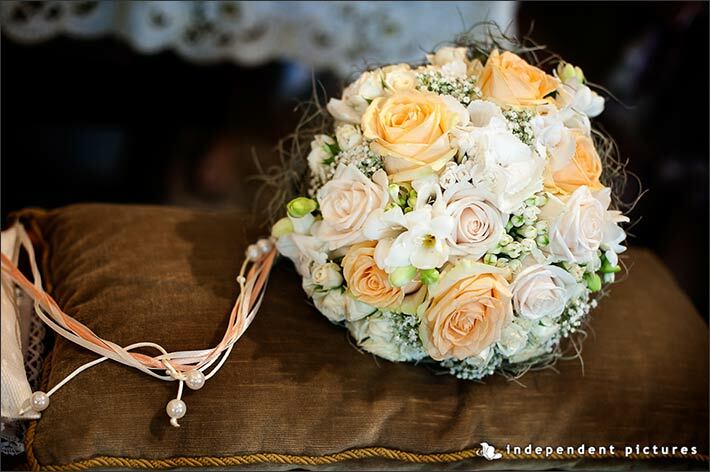 Have a look at it… ins’t it simply beautiful with some little peach and ivory details? And what about Laura’s wedding dress? We think it is really pretty! 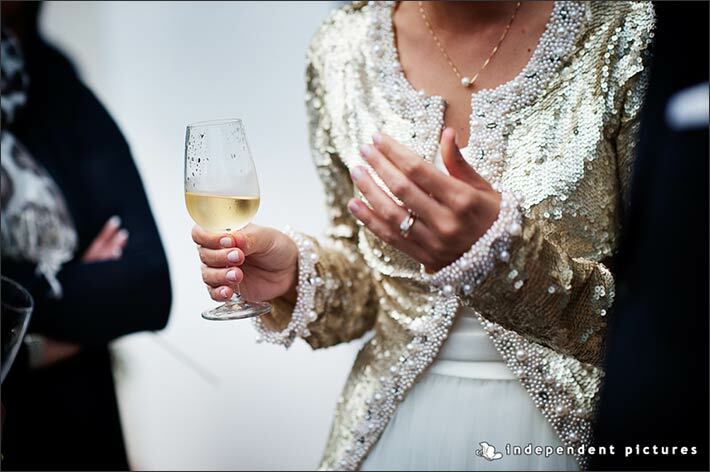 A long light gowns with a sparkling jacket. She was amazing in it! 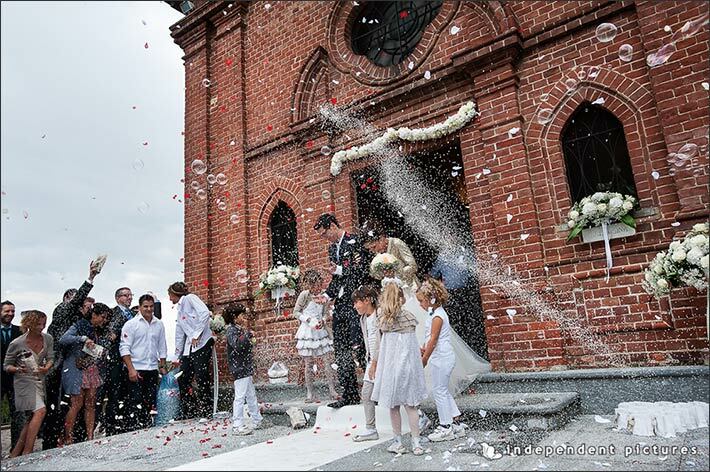 The church was in Laura and Matteo’s dreams as both Laura and Matteo’s parents got married in it lots of years before. 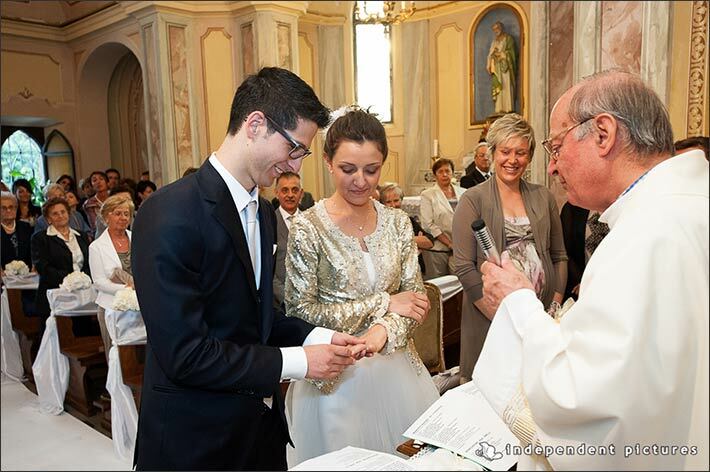 As the matter of fact Laura and Matteo are both Italian and both live in Langhe area. 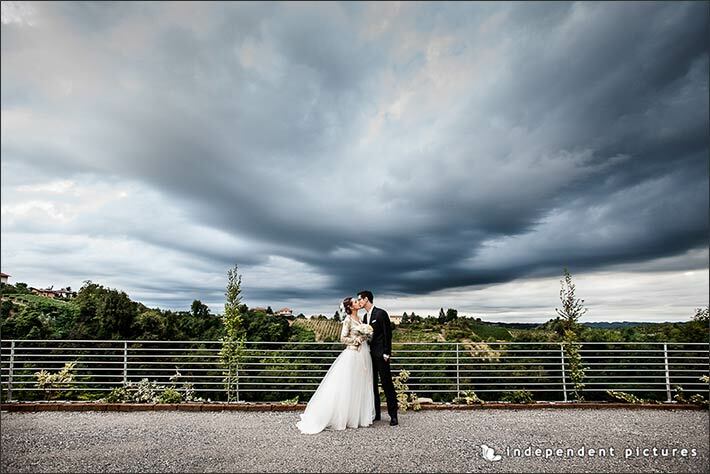 They could not choose a better solution than Langhe for their special wedding! 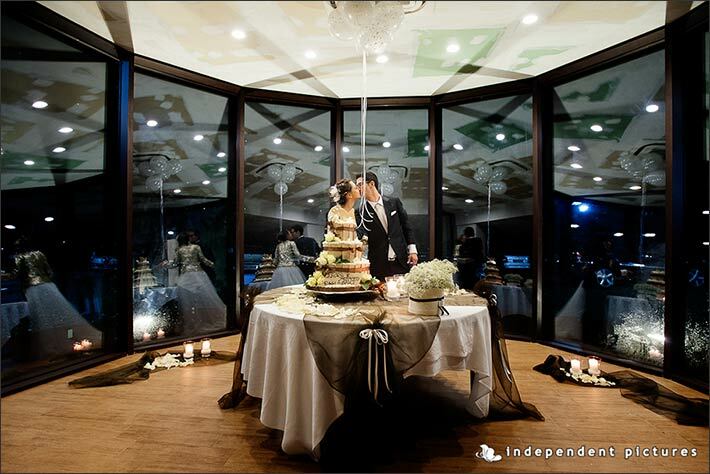 The reception was planned at Matteo’s uncle vinery estate. Matteo’s uncle owns a wonderful vinery estate that Laura and Matteo were both happy to use as their wedding reception venue. However this could be a lovely solution even for other couples! A wedding in a local winery estate could be the perfect choice for a rustic and authentic event in the vines in wonderful Piemonte countryside. The venue has just been finished and it reproduces the shape of a barrique barrel made all in glass. It is 12 meters and it creates a tall terrace with a breathtaking view over all the vines of the estate! Have a look to the great photos by Independent Pictures Photography here… landscape on the vines is really amazing and dramatic! Reception meal was provided by Matteo’s family that also owns a restaurant in the area. Wonderful food and delicious wines from the vines below them… just a dream! 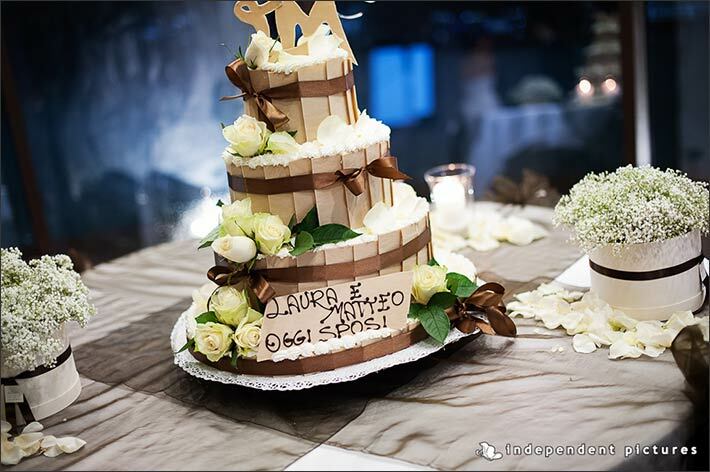 For the reception Laura’s wanted white color and a touch of brown to evoke countryside palette. 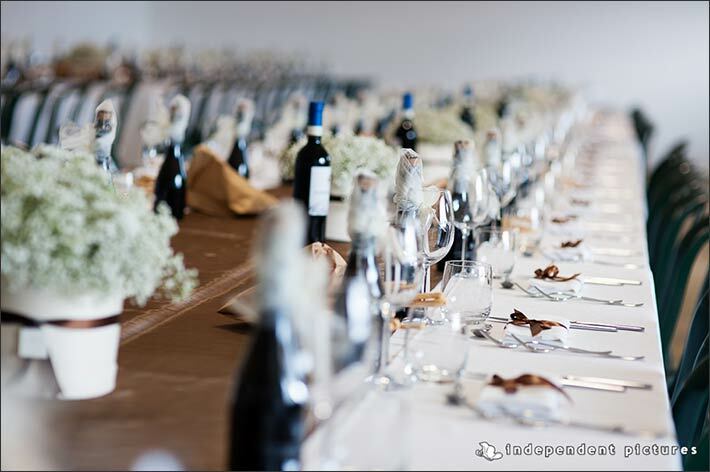 Vases with baby’s breath, brown ribbons and runner to decorate the long table for all the guests. 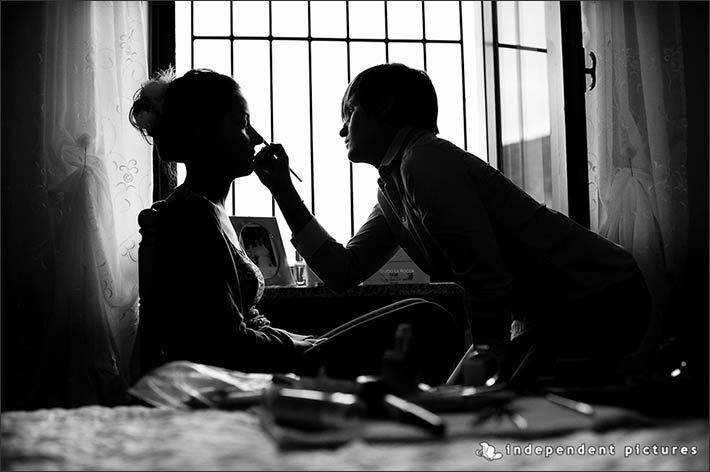 Everybody could enjoy the pleasure of being at the same table of Bride and groom. 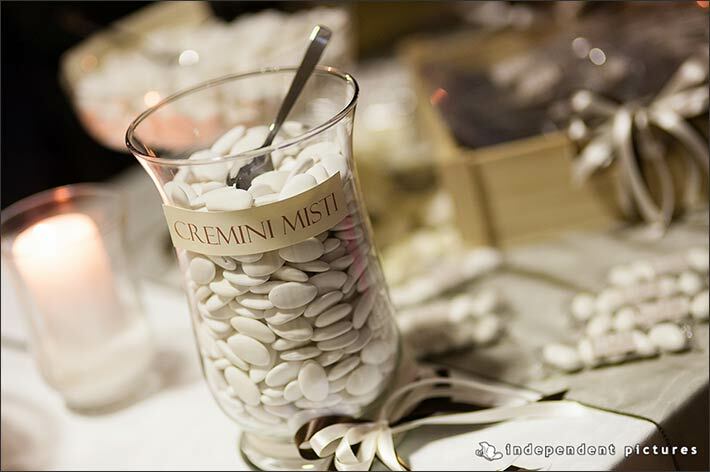 Sugared almonds in pots and an wonderful tiered wedding cake completed the party. 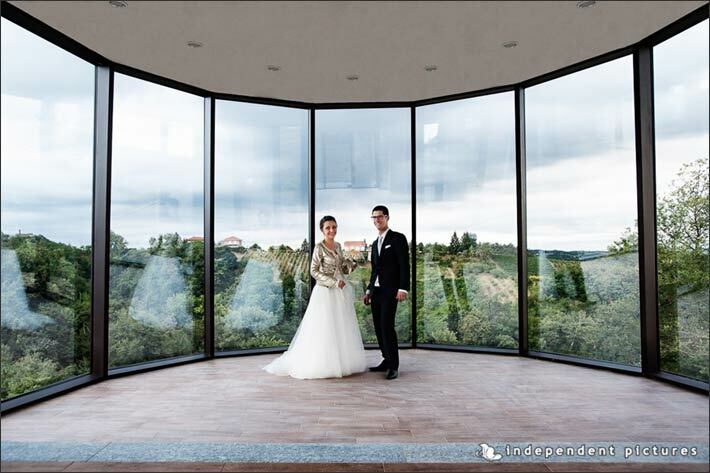 Laura and Matteo cut it on the glass terrace overlooking the vines…. at night! 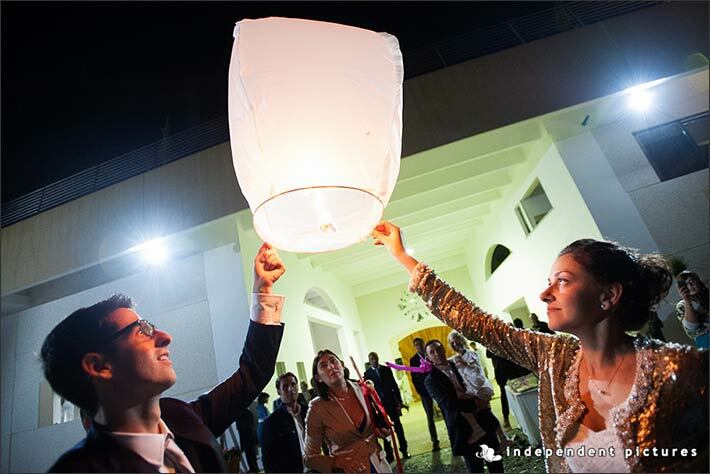 And to end a romantic wedding in a dreamy way lovely sky lanterns over the sky. Now the fun party can really begin! Congratulations Laura and Matteo for this wonderful, simple but really fine and elegant wedding in Langhe Piemonte countryside.